This, from a guy who was announced as the winner of the Tech5 competition at The Next Web Conference Europe as one of Europe’s fastest growing startups of 2015, along with Blacklane CEO Jens Wohltorf and YPlan’s Davide Scalzo. Bas van Abel is not your typical startup CEO (as if there were a “typical” startup founder, but let’s skip that point for now). With a background in arts and interaction design, van Abel has the look-and-feel of a Dutch ‘let’s make the world better’-activist. Short beard, flowing hair and a huge concern for the well-being of African miners and Chinese factory workers. It would be all too easy to imagine him at the bow of a Greenpeace speedboat obstructing Japanese whalers or corrupt oilmen looking to pollute the pristine waters of the Croatian Adriatic. 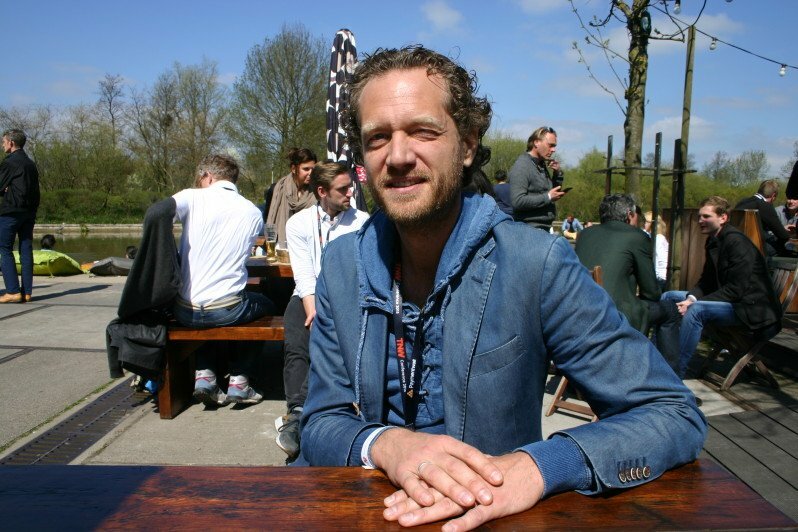 Van Abel, founder and CEO of Fairphone, certainly has plans to change the world. The way he and his team see it, the piece of the global economy that needs changing is the supply chain. You know, that complicated, opaque thing, which brings parts and materials to factories, produces our beloved gadgets and ships them to the shops or telcos, where we can finally lay our ever-hungry fingers on the latest goods – phones, tablets, notebooks, TVs and watches. Bas van Abel, Fairphone CEO at The Next Web Europe 2015. As with a fine, medium rare ribeye steak, many of us prefer not to be acquainted with everything that needs to be done behind the scenes to feed our desire. A slaughterhouse in Denmark “processes” twenty thousand pigs a day. What a number! Would you like to visit the place and check out how it’s done? Yeah… I didn’t think so. Much of what goes into our gadgets is dug up from the ground in ‘conflict minerals‘ mines. This innocent-sounding phrase means that millions of people – 5.4 million, by some estimates – have died in conflict in resource-rich countries and regions, notably in Africa and particularly in Congo. As inconvenient as it may be to hear it, your phone and mine have blood dripping from them. Van Abel and Fairphone are out to change that. Fairphone started as an idea for an awareness campaign. Early on in the project, the Dutch company realised that the best campaign would be to be a real, live phone manufacturer. The company intends to push for improvements in the supply chain – and in the industry overall – while building a company that actually makes phones and sells them to people. After three years of campaigning and research, Fairphone launched a crowdfunding campaign in May 2013. No Kickstarter, no Indiegogo – just a website inviting you to pre-order a phone. A phone that didn’t exist, from a company that had never made phones before. The team figured they needed 5,000 pre-orders to be able to place a purchase order – backed by real money from customers – to their Chinese suppliers. All of the hard work in campaigning and visibility seemed to pay off. The campaign hit 10,000 orders in the first three weeks with Dutch telco KPN agreeing to pre-purchase a thousand units. From a company that had never made phones before, KPN’s very public support was a green-light for many consumers. By the time the dust had settled, van Abel was looking at several million euros in his bank account. The company had just been established. He needed to transfer €1.5 million to the manufacturer in China for the order – and panicked. Once he overcame this momentous hesitation, van Abel decided to finally push “the damn button” and made the payment to his suppliers. Fast forward to the present. Fairphone is now a 38-person company that has shipped 60,000 phones. That’s quite a big number for an ‘awareness campaign’ but obviously super tiny for a phone manufacturer. The Fairphone strives to be as fair and open as is reasonably possible for a real product that needs to be on the market and reach customers. What about the impact such a small manufacturer can have on the global phone industry? “Being a successful, commercial company is the best way we can make an impact. More people will learn about these issues than we can supply with phones. Then these consumers will voice their concerns to other bigger, mainstream phone companies. They will demand fairer phones and they will put pressure on them concerning the key issues which we are highlighting: conditions in the mining industry, factories and throughout the supply chain,” he added. Today Fairphone announced a major step forward for the company: Fairphone 2. Unlike the first model, which was designed by the supplier, this design comes from the company itself with millions having been invested in product development. Fix it yourself: the dissassembled Fairphone 2. Van Abel and Fairphone have a religious zeal for open design and open technology. “If we use a Qualcomm processor, that means we can have a much more open stack than with others. Designing the new phone from the inside out gives Fairphone the ability to integrate its values into the phone itself, focusing on increasing the product’s longevity and sense of ownership among users by employing a game-changing modular architecture,” he said. 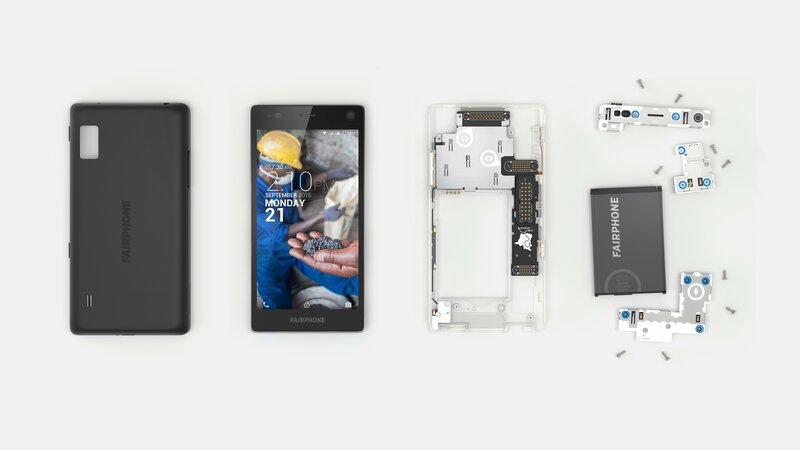 “The Fairphone 2 can be easily disassembled to allow owners to repair the most commonly broken parts themselves, including the display, camera, speaker and receiver. In addition, we sell spare parts and provide repair tutorials.” added van Abel. So basically, you can open up your Fairphone with a normal screwdriver. The battery is replaceable. The OS is rootable by design. Fairphone is looking at the phone recycling process as well, making sure that it’s as easy as possible to recycle and reuse the parts and components once you’re done with your gadget and are ready to move on to the next version. Changing culture, mindsets and business practices is always a tough game, and even tougher in the complicated world of electronics supply chains. It seems that van Abel and the Fairphone team are reaching a growing fan base, but it remains to be seen how far they can go in pushing the Apples and Samsungs of the world.